I usually only review American ciders, but I do enjoy ciders from many different places. My palate doesn't discriminate by region. 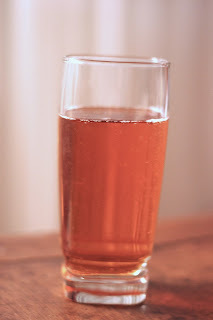 When I was on a trip home to Kentucky recently, I promised to look at what I could find in terms of local cider selection and write about it. The most interesting thing I found had to be Thatcher's Green Goblin. I got the very last bottle at a Liquor Barn in Louisville KY and I had to climb on the shelves to get. And this wasn't even on Black Friday! In any case, I was thrilled to see something I do not usually see, hence a review of a decidedly English Cider. Hopefully in coming years, I'll see some Kentucky ciders. We do have the apples after all. If you've ever heard of a Kentucky cider, please let me know! Thatcher's Green Goblin has its own website at http://www.greengoblincider.co.uk/ and for more information, this page has more detail http://www.greengoblincider.co.uk/cider.htm. The promotional copy isn't particularly descriptive, but it does emphasize that the apples are English and that the cider is oaked. Here's how they put it: "The Green Goblin from deep in the wood - 100 year-old oak vats, that is. Made with English apples, and matured in oak vats, Green Goblin cider is a full-flavoured, bittersweet blend, beautifully balanced to give a fresh character with a medium dry finish." When reading about their cider process, they list two apple varieties Somerset Redstreak and Dabinette both grown in the West County region. I know both of those apples from several US ciders that use them for tannins, so I'm even more curious than I had been before. Seriously, the color is deep papaya. I've never seen another cider like it. When poured, this cider had no foam or head. As I hope the photo shows, it has no haziness and is instead clear and brilliant. What a beautiful cider! This earthy smell is delightfully cidery but in an unexpected way because it offers almost no apple, and absolutely no yeast. Instead I smelled stone and wood with just a smidge of acidic fruit. Thinking about that fruitiness, ripe persimmon rather captures it. While the dryness is not extreme, this cider defnitely comes across more dry than sweet. I think the dryness combines with the tannins to emphasize those elements more than sweetness or fruit. Flavors and drinking experience: high tannins, low acid, dry. Woody. I taste tannins most predominantly in the Green Goblin and I love it. The tannins are soft and not overly aggressive because they are balanced with some lovely apple notes and low acidity. The cider tastes very woody in that almost drying way. Some folks don't care for this, but I'm totally into it. I get hints of leather but those are restrained. Some subtle spicy fruits and farminess give character to the apple. The Green Goblin has fairly intense levels of carbonation, but they lighten up what is otherwise a fairly dark-tasting beverage, so I'm not complaining. The finish lingers with more wood and spice, but at this point the farmyard notes have all disappeared, giving it an evolving taste. This cider strikes me so deeply enjoyable because of its maturity and balance. I shared the Green Goblin with my mother who doesn't usually care for cider, but she loved the complexity and drinkability of the Green Goblin. She's totally right; it is exceptionally good. I can now add oaking to my list of techniques that make a cider more likely to make my list of repeat buys. Nice. When thinking of food pairings, I can see a few different directions suiting the Green Goblin. In summer, I'd drink this with a capese salad with loads of fresh mozzarella and some aged balsamic vinegar. In winter, pair the Green Goblin with pasta in cream sauce with walnuts and broccoli. In terms of activities, I'd bring this to a gathering full of new people. The cider has so many different nuances that it makes a great conversation starter, and I'm confident most folks who try would find it both enjoyable and interesting. Besides, I'm always looking to use parties as a way to make more drinkers into cider drinkers. It seems we have the same taste preference in cider. I agree with all of your comments and flavor notes. I also really like your pairing Tips, will do. Would you put this on your shortlist? Are there any other ciders that you like better in the same flavor range? This was the first oak aged cider and the first international cider I ever tried, and although I prefer ciders significantly sweeter than this, it was quite tasty. Agreed it has an unusual color...the closest to that color I've seen is something like Angry Orchard Iceman (which is definitely very sweet). Great review!